When Mitch McConnell called off a Senate vote on the Better Care Reconciliation Act (the Senate version of Trumpcare) just before the Independence Day recess, he was by most accounts a good nine or ten senators short of the 50 he needed to pass the legislation. Four recalcitrant senators — Ted Cruz, Ron Johnson, Mike Lee, and Rand Paul — seemed to oppose the bill from the right. And echoing Paul Ryan’s ultimately successful strategy in the House, McConnell appeared to decide shoring up conservative support was the place to start in getting to 50. And so the one big change in the health-care portions of the draft legislation that McConnell seemed willing to accommodate was the Cruz-Lee proposal to let insurers sell cheaper and less comprehensive plans in the individual markets so long as they offer one Obamacare-compliant plan. The objective was to significantly lower premiums for the kind of people Republicans seem most solicitous about — younger and healthier people buying individual policies who aren’t poor enough to qualify for purchasing subsidies. The idea may have indeed brought Cruz, Lee, and Johnson onboard, but it has also created a firestorm of criticism that if implemented it would represent an indirect attack on the affordability of Obamacare-compliant policies sold to not-so-healthy people — thus raising the very alarms about people with preexisting conditions that nearly sank the House bill. Cruz-Lee also created some collateral problems: It is not clear it will pass muster with the Senate parliamentarian as budget-germane, and thus includable in the Senate bill. And it is in danger of becoming an absolute precondition for support among some conservatives — notably Lee and perhaps even House Freedom Caucus chairman Mark Meadows — reducing McConnell’s flexibility considerably. [T]he best that is offered is Obamacare-lite: keeping the Obamacare subsidies, keeping some of the Obamacare taxes, creating a giant insurance bailout superfund, and keeping most of the Obamacare regulations. Indeed, the Cruz-Lee proposal may have had ripple effects that pushed Paul even further away from a “yea” on BCRA. The only real pot of sweeteners McConnell possesses is an amount somewhere north of $200 billion over ten years generated by delaying the repeal of two high-end taxes created by the Affordable Care Act (one a tax on capital gains by the highest earners and the other a Medicare surcharge for much the same people). One might have expected McConnell to use that money to soften the Medicaid cuts some Senate moderates (notably Susan Collins, Lisa Murkowski, Dean Heller, and Rob Portman) have been complaining about. Instead it seems he’s splitting the money between higher tax credits for very vulnerable populations and funds the states can use to help insurers avoid big premium hikes for people with preexisting conditions. These personal and insurer subsidies are precisely what makes Rand Paul and some conservative groups crazy. Meanwhile, the Medicaid cuts are going to be a potentially insurmountable problem, especially for Susan Collins, who has said nearly as many nasty things about BCRA as Paul has. 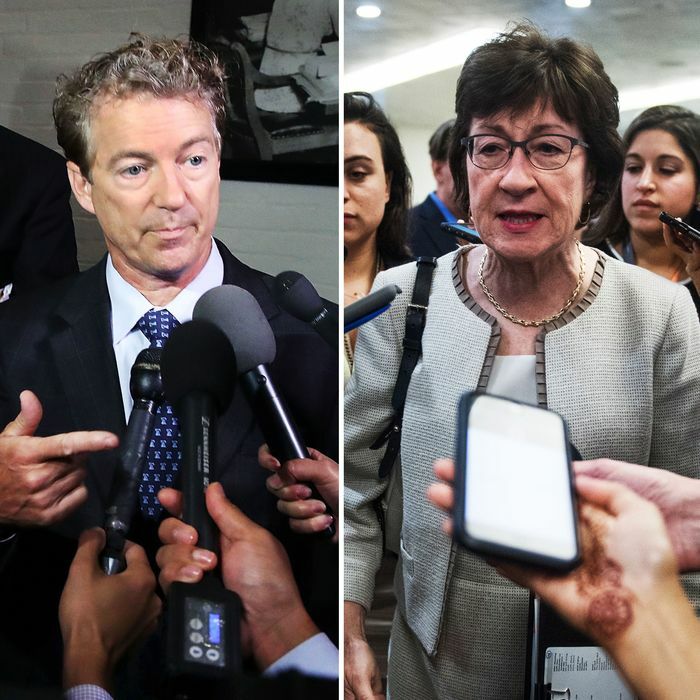 And as it happens, both these senators have never really been on the reservation to begin with: Collins is the only current GOP senator who voted against the 2015 “test run” legislation repealing Obamacare, and Rand Paul cast the only GOP Senate vote against the very fiscal-year 2017 budget resolution that authorized the current legislation. If Collins and Paul are indeed “hard no” votes on BCRA, that means each and every one of the remaining 50 Republican senators have enormous leverage over the bill, and many will have their hands out. Two senators with potentially insatiable appetites will be Alaska’s Susan Murkowski (the Trump administration just chipped in with a big waiver that could help her state deal with its complicated health-care delivery problems) and Dean Heller, the politically vulnerable Nevadan who’s made it clear only a significant reversal of Medicaid cuts will earn his vote. And there could be a full-fledged stampede away from the bill if the Congressional Budget Office score of the legislation (due on Monday) is anything nearly as bad as its assessment of the original BCRA. All in all, McConnell’s reputation for legislative wizardry is no longer enough to justify any optimism about prospects for Senate passage of Trumpcare. He can only put off a vote for so long without sabotaging the rest of the GOP agenda, and he seems to be out of ammunition to pull enough senators across the line. If Rand Paul and Susan Collins suddenly reverse themselves and begin thumping the tubs for BCRA, there’s still a chance, but that would require not only giant flip-flops but a complete blurring of all the GOP’s ideological lines. More than likely, Mitch McConnell is about ready to throw up his hands and move on to the next fight over what Republicans do in the absence of Trumpcare.